On Sunday, January 27, 2019 Lee Taylor passed away in Emmett, surrounded by his loving family. He was born in Emmett on January 20, 1939 to Mary and Callie Taylor and grew up in Emmett. As a youngster, he loved working on his Shaw grandparent’s fruit ranch and as a butcher at his family’s Taylors Market. Lee married Darla Peterson in June, 1962 at Pineapple Junction and together they had three sons, Steven, Donald and Scott. They lived in Chester, California in the 1960s when Lee worked for Collins Pine Lumber Co. He served in the Idaho Army National Guard, including active duty at Fort Lewis, Washington during the Berlin crisis. 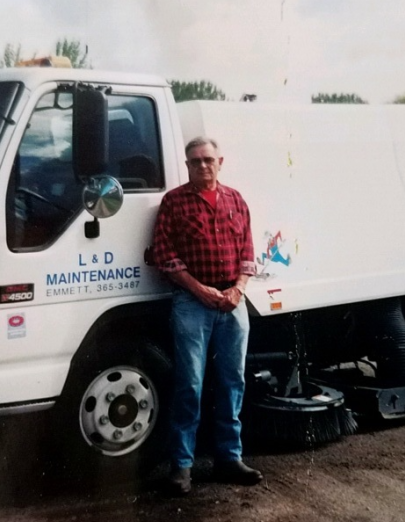 He founded and ran his business, L&D Maintenance, for a number of years. After retirement, he lived for 11 years in Virginia on his sister & brother-in-law’s farm. Lee had a wide circle of friends who adored him, and he adored them. His love of travel took him all over the country, Canada and Europe. He was always drawn to the Oregon coast; it was the place he loved the most. Lee is survived by sons Steve (Lori), Scott (Elise), his brother Keith (Judy) and sister Carole (George), grandsons Ryan, Michael, Gabe, Jason and Derek Taylor, and several nieces and nephews. Also surviving are his much-loved first cousins: Janet McConnell, Diane Wolf and David Goodwin; David Shaw, Susan Shaw Crouch, John Shaw and Bob Shaw. He was preceded in death by his parents and his son Donnie. Lee’s family would like to thank the dedicated professionals of Lighthouse Hospice and his wonderful caregivers at River’s Edge during his short stay. Please join Lee’s family and friends in celebrating his life on Saturday, February 2 at 3:00 p.m. at Willow Grove Events, 4131 W. Central Rd., Emmett. Local arrangements are with the Potter Funeral Chapel in Emmett.